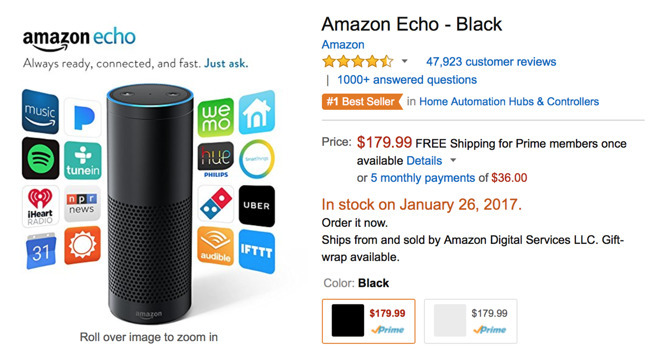 Amazon has declared the holiday 2016 shopping season as "the best-ever season" for its voice-driven personal assistant Alexa, despite having problems keeping the sought-after devices in stock. In a press release heralding Amazon's holiday performance, the company notes that the Amazon Echo family of devices —including the Echo Dot, Echo Tap, Fire TV Stick, Fire Tablet, and Amazon Echo —grew more than 9 times versus the 2015 holiday season. Apple has no stand-alone speaker device like the Alexa-powered Dot, Echo, or Tap. Apple's Siri is included in the iPhone, and iPad, with a more limited implementation in the Apple TV Siri remote. 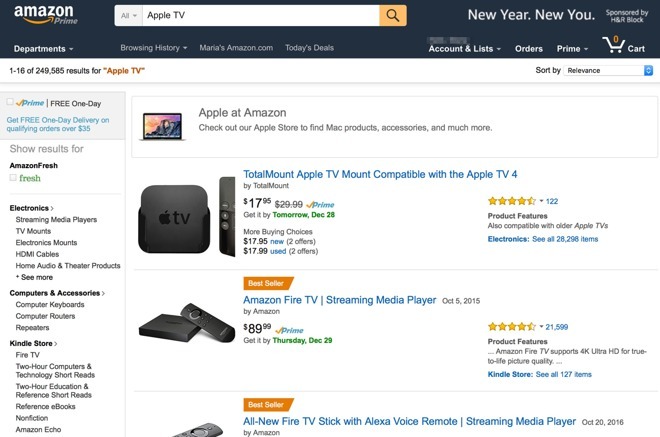 Amazon continues to refuse to sell the fourth-generation Apple TV, instead, offering up a mount for the device as a first choice, and the Amazon Fire TV as a "Best Seller" in its place. Highlights pointed out for the sales period by Amazon include more than 72 percent of Amazon customers worldwide shopped with a mobile device, with a growth of 56 percent in Amazon's mobile app alone. Amazon very rarely divulges specific numbers of devices sold, only calling it "millions," and has only referred to them in proportion to the previous year. Other vague statistics about sales this holiday season from Amazon include enough 4K televisions were sold to reach the peak of Mount Everest more than 9 times, and sufficient Sphero Star Wars BB-8 App-Controlled Robots were sold to roll as a relay around the Earth more than two times before the batteries collectively run out. Apple-compatible devices and accessories leading Amazon sales charts were declared to be the 6-foot AmazonBasics Certified Lightning to USB Cable in the Wireless category, the AmazonBasics Mini DisplayPort (Thunderbolt) to HDMI Adapter in the PC section, the Blue Yeti USB Microphone in Musical Instruments, and the GoPro Hero5 camera. AppleInsider noted on Monday that Amazon Alexa was one of the top trending searches on the App Store after Christmas, suggesting customers were looking to connect to a new Echo accessory gifted for the holidays. The Amazon Alexa app continued to rank as the sixth most popular free download on the App Store as of Tuesday afternoon. Other potential hits this holiday season, based on App Store trends following Christmas, included Fitbit fitness tracking accessories, low-priced camera drones, GoPros, Google Cardboard virtual reality, and the Furbo Dog Camera, a treat-tossing Wi-Fi camera with two-way audio.